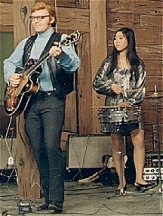 My Gretsch Country Club guitar was purchased a few months before Sue-On and I were married in the summer of '66. The Club, along with my first Fender Telecaster, was chosen to replace my first Gretsch, the Chet Atkins Nashville model after it had been stolen. At this time, I was very much into using a De Armond volume pedal for sustain to simulate steel guitar sounds. This was a technique I had picked up after watching Ferlin Husky's lead player use it at a Brandon Arena show a few years earlier. Also, by this time I was using what I believe was the first ever distortion pedal: the Gibson/ Maestro Fuzz-Tone. It was originally pitched as a brass instrument emulator, but the reaction this wild driving sound got from audiences was nothing like that obtained by any brass instrument. In fact, it is hard to imagine now that there was a time when rock guitars didn't use distortion. So, although I used both guitars at every gig, I found that the bite of the Tele was more appropriate for the style I was developing and I used the Gretsch less and less. Then, when my original Gretsch was recovered, the Country Club was left at home, to be brought out for the occasional special function, practise or television show. It is really quite a gorgeous instrument and I always thought it would be an ideal jazz or big band instrument if the opportunity ever came along for me to play in such a band. My only regret with the instrument is that, to cut costs, I had ordered a chrome Bigsby rather than the brass model. All the other fittings on this sunburst guitar are brass, so the Bigsby isn't a good match. This showpiece seems to be a close cousin to the very much in demand, thick bodied 6120 and deserves to be played much more than it is . . . O well . . . someday . . . . The Country Club was in many ways Gretsch's most traditional guitar. Although they are not as avidly sought as White Falcons and 6120s, they are also among the company's best. Among Gretsch's first commercially successful electrics, the Country Clubs were directly descended from the 6030 and 6031 of the Synchromatic line, which were in turn directly descended from the pre-war "cat-eye" Synchromatic 300. In other words, the 6192 and 6193 Clubs were 17-inch pedigreed jazz boxes when they were introduced in 1951. 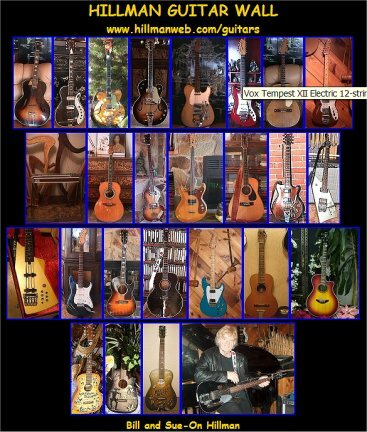 They were the largest Gretsch electric models, other than the White Falcon, and the only guitars in the line other than the Falcon to use a spruce top, although spruce is rarely found after '55. 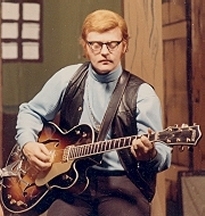 Clubs were never offered with a stock Bigsby whammy bar, although one was available as an extra cost option some years. Until late 1954, when the entire range of guitars was revamped, Gretsch used small plastic knobs on the few Country Clubs made. These early Country Clubs are usually known as Electro II's, and evidence suggests Gretsch was inconsistent naming them. The 1955 model year was a major turning point for Gretsch across the guitar range, and in the Country Club line it was the first for the Cadillac Green 6196 and the earlier Synchromatic-style tailpiece was phased out about this time in favor of the common G-cutout style. Some 6196s have appeared in two-tone gray and other colors, suggesting 6196 was originally a custom paint code before Cadillac Green was established as a standard color. Starting in 1958 FilterTron pickups replaced DeArmonds, along with other changes corresponding with the rest of the Gretsch range, including the addition of the tone switch in place of the previous knob. Stereo models were also offered, under model numbers 6101, '02 and '03, but they were never popular. The earliest, '58 and '59 stereo models are easily identified by their close-spaced pickups. The "zero fret" became standard in 1960, and the body was thinned to about 1 7/8 inches in 1961, about the same time the stereo wiring was simplified and the pickups moved back to the normal positions. The Clubs never went to the double-cutaway Electrotone body, and the thinner body was a relatively short-lived experiment in the line. By 1964 they had plumped back up to 2 3/4 inches. Even though the body remained a single-cutaway, the Clubs did receive the Gretsch padded-back treatment, along with a standby switch and string mutes. These other additions were also short-lived and long gone by 1964 or '65. Flattop or arrow engraved metal knobs. Tortoiseshell pickguard replaced with gold plastic. Synchromatic-era script on headstock. replaced with familiar block letter logo. G and arrow knobs begin to appear. Tone knob replaced by tone switch on upper bout. Space control bridge replaces Melita. Zero fret begins to appear. Stereo model's pickups moved to normal positions. Three tone switches on upper bout. Body thinned to 1 7/8"
Single mute added. Earliest versions dial up, later flip up type with simpler knob. Body widened again to 2 3/4" midyear. Grover "kidney button" tuners replace Imperials. Padded back deleted and muffler dropped. Baldwin-era pickguard begins to appear. New tailpiece with plastic insert. Truss rod adjustment moved to neck heel. 7577 Antique maple finish offered. Scale length returns to 25.5"
Two volume/two tone with master volume switching setup. G-cutout tailpiece replaced by frame type with plastic inlay. Cadillac Green was phased out in 1968, and Baldwin-era changes began. By 1972, the 7576 and 7577 designations had begun, and the Club soldiered on, selling in small numbers, until the factory shutdown in 1981. 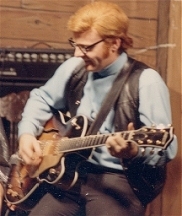 It was far and away Gretsch's longest lasting model. The Country Club was re-introduced in 1998 as one of Gretsch's made-in-America, very-expensive Custom series. Aristocratic Renaissance in a Re-issue of the 1958 model. The Country Classic traces its lineage to the jazz greats. This hollow-body electric with ebony-fingerboard, neo-classic position markers and crowning, gold-plated name plate is the king of swing.